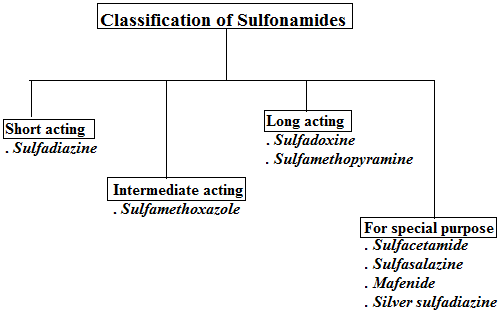 Sulfonamides are one of the antibiotics discovered in the very early era of chemotherapy. Although they are little obsolete in use after the development of more antibiotics but from the point of view of GPAT this topic should be studied in detail. 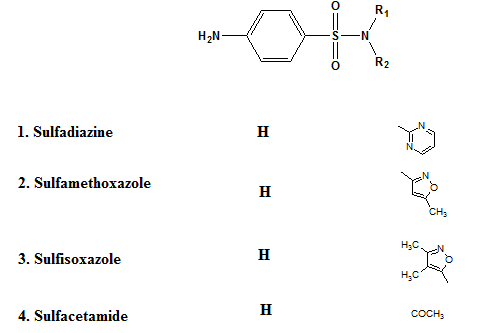 In this article, complete pharmacology & chemistry of the sulfonamides & cotrimoxazole is discussed in detail. Prontosil was the dye (1937, Domagk) which was discovered accidentally as antibiotic containing sulfanilamide. Structural resemblance of sulfonamide to para-amino benzoic acid (PABA) is responsible for their action. The functional group that differs in the 2 molecules is carboxyl of PABA & sulfonamide moiety of sulfanilamide. The strongly electron withdrawing character of the aromatic SO2 group makes the N atom to which it is directly attached partially electropositive. This, in turn, increases the acidity of hydrogen atoms attached to the nitrogen so that this functional group is slightly acidic (pKa = 10.4). pKa of the carboxyl group of PABA is 6.5. The replacement of one of the NH2 hydrogens by an electron withdrawing hetero aromatic ring was not only consistenet with anti microbial activity but also increase potency (also increase acidity of remaining H). 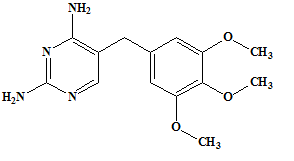 This substitution also increases the water solubility by decreasing pKa (near to 7). Hence, decrease the crystalluria problem. 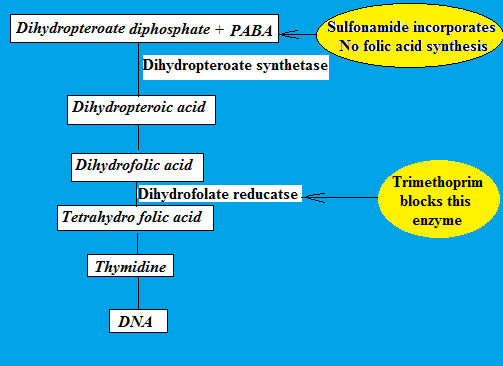 Structural resemblance of sulfonamide to PABA is mainly responsible for its mechanism action. Decrease metabolism of phenytoin & warfarin. Concentration: (Sulfomethoxazole) 20: 1 (Trimethoprim) for optimal activity. This 20:1 concentration is achieved by giving a dose of ratio 5:1 because trimethoprim has larger volume of distribution. You are free to make a comment below if you have any doubt or query regarding the topic. We will happily try to solve it. All the best for your preparation.